NOTE: This product requires refrigeration during storage, but not during shipping. Just like LivOn Labs’ other Lypo-SphericTM Supplements, Lypo-SphericTM Acetyl L-Carnitinecontains no sugar, no starch, no artificial flavors or colors. This supplement is also vegan-friendly, gluten-free and non-GMO. Lypo-Spheric B Complex Plus (1 Carton) (GUARANTEED NON-GMO) - is an unique combination of superior nutrients and liposomal encapsulation technology makes this B-Complex formulation the most comprehensive and powerful supplement of its kind. - 30 packets per box Carton. This innovative formula by LivOn Labs incorporates superior, active forms of B-Vitamins such as Benfotiamine, a fat soluble form of Thiamine (B1), Methylcobalamin (B12), Niacinamide (B3) and Pyridoxal 5 phosphate + Pyridoxine HCl (B6), selenomethionine as selenium, and a new source of phospholipids - all to ensure that every ingredient is non-GM. 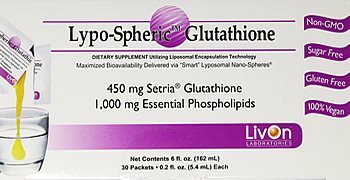 Lypo-Spheric GSH: Glutathione (GUARANTEED NON-GMO) by LivOn Labs - Your Body's Most Powerful Protector - 30 packets per box Carton. 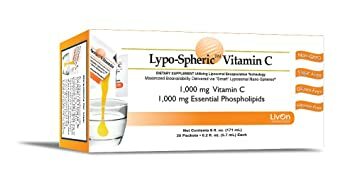 LypoSpheric Vitamin C™ (GUARANTEED NON-GMO) by LivOn Labs has been called "Vitamin C on steroids!" This is because it utilizes state-of-the-art Liposomal Encapsulation Technology (LET). LET allows the nano-scopic spheres of Lypo-Spheric™ Vitamin C to... quickly navigate through the digestive system eliminate need for digestive activity prior to assimilation rapidly absorb in the small intestine move intact, directly to the cells that need it. release the powerful, non-degraded Vitamin C for use throughout the body as the liposomal material is assimilated by the phospholipid-craving cells that are under attack. provide maximum assimilation and bio-availability. Each Carton contains 30 packets of Lypo-Spheric Vitamin C.
Lypo-Spheric™ AGE Blocker™ is the most comprehensive, anti-aging, metabolism-boosting supplement anywhere (30 packets per box Carton). Please note Lypo-Spheric AGE Blocker has been discontinued and replaced with Lypo-Spheric B Complex Plus.